Do you love hiking in the great outdoors? Did you think those days were over now you have a child? They don’t need to be — let me open your eyes to the best hiking carriers for your little one. The days of stiff, cumbersome carriers for our tiny humans are long gone. Today’s hiking carriers have been designed with both your own and your child’s comfort in mind. 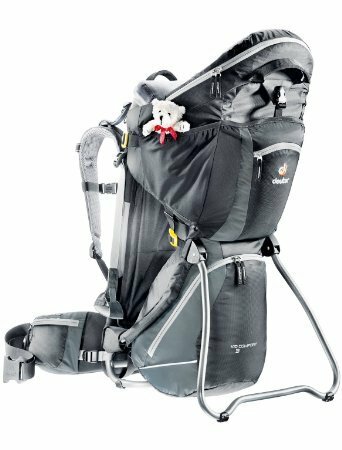 Lightweight and adjustable, some now have all the bells and whistles you could ever need for a day out with your child. Whether you choose the park, the forest, or a mountain trail, or simply a meander around your neighborhood, there are some places where a stroller just won’t work. Let’s take a closer look at how to use hiking carriers, exactly what to look for when buying one, plus our top picks for the best options on the market today. Use the links above to check the latest prices or read our in-depth hiking carrier reviews below. When Will My Child Be Ready for Hiking? Maybe the question is, when will you be ready for hiking? Some moms recover from childbirth quite quickly, while for others, it will take longer. The last thing I felt like doing after a difficult birth was to put on my walking boots, with or without a carrier. However, many women following an uncomplicated vaginal birth might be ready to get back outdoors within a few days or weeks. Following a C-section, you should be guided by your physician as to when you can start exercising again (source). 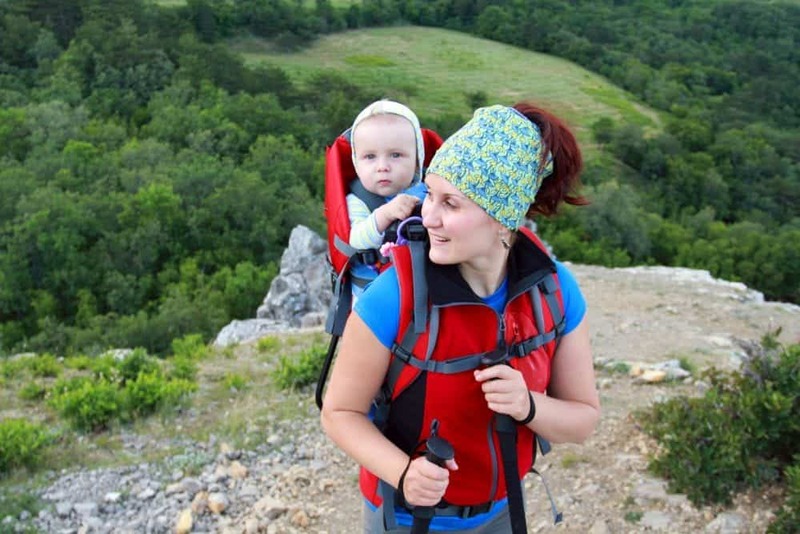 As far as your little one is concerned, a large hiking carrier isn’t suitable for a newborn. However, there are carriers designed for very young babies, which let them snuggle up cozy and warm in front of you while you walk. Once your child can sit up on their own and hold their head stable, then progressing to a framed hiking carrier should be fine. This is generally when they’re about six months old. It’s a good idea to check with your pediatrician to see if your baby is ready for a big kid’s carrier (source). Your child’s age and the type of hiking you want to do can influence your choice of carrier, but there’s sure to be one to suit your needs. Since carriers can be quite an investment, it’s worth taking the time to consider a few factors before you make the plunge. Babies from birth to six months of age will need to be transported in an infant carrier. This will support their heads and hold them close to you, so they can feel safe and hear your heartbeat. It’s a bit like being in the womb, but from the outside. At this young age, they’re unlikely to be too interested in what’s going on around them. Sleep is generally on the agenda, so make sure the carrier is comfortable enough for them to nod off. Once your bundle of joy can sit unaided and hold their head steady, they will be ready for a framed hiking carrier, with their own personal cockpit. Many of these carriers are made by companies that make backpacks. 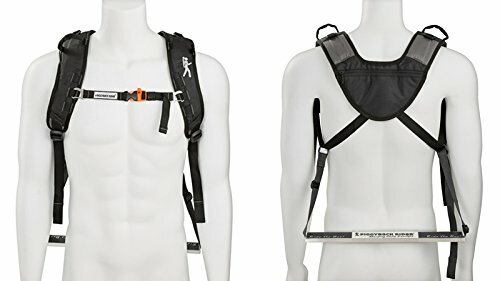 This is a fancy name for a load-supporting system consisting of shoulder straps, load lifting straps, chest strap and stabilizing straps. The ability to adjust these straps means a carrier can be used by either parent, with quick and easy adjustments. So when one of you runs out of steam halfway through the hike, you can simply swap carrying duties. A sturdy and lightweight aluminum frame gives the carrier support without adding too many pounds. It also helps distribute the weight of your ever-growing cargo onto your hips, rather than your shoulders. For me, this is one of the key factors in choosing a carrier for your little tyke. The more comfortable the carrier, the more likely you are to use it often. Look for padding in the shoulders, and a hip belt that is padded but firm enough to give support. While soft and squishy might feel comfortable in the short term, on long hikes it won’t provide the weight-bearing support you need. Another key feature to look for is, naturally, the comfort and safety a carrier provides for your little passenger. It should have plenty of support for the child’s back, an adjustable seat to allow for growth, and a good harness. Padding is essential for delicate legs and arms. These will help keep your child’s legs in a comfortable “M” position, and support their legs. Stirrups are especially useful for older babies and those with longer legs. You don’t want their legs to be dangling, as this isn’t good for their hips (source). Sometimes referred to as the cockpit area, you want baby’s seating space to be comfortable enough if they drift off to sleep. Consequently, another feature to look for is a padded, cushioned bar in the front, also called a dribble bar. This will help support a droopy head should they fall asleep. It’s also a good idea if this is removable and washable, making it easy to clean if — sorry, when — it gets covered in drool. You leave home for a hike and it’s a pleasant day with light cloud cover — perfect. Then it all changes — the weather always conspires against you. Either the sun comes out and it’s blazing hot, or the heavens open and deposit what seems like Niagara Falls on your head. An integrated sunshade will protect delicate baby skin from the effects of the sun. It may also give some protection from a light shower. A rain cover will help keep little ones dry in a downpour, but don’t be tempted to use these as sunshades. Rain covers have waterproofing and tend to be larger, offering less ventilation. Using this as a sunshade would mean one very hot, sweaty baby. Of the two, a sunshade is by far the most important. Wet clothes can be changed and baby dried off, but sunburn can cause serious skin damage (source). While you might check the weight a carrier can accommodate for a child, you might not think about the actual weight of the carrier itself. This can make a big difference in how you feel at the end of the day when your muscles are aching. Just a couple of extra pounds can add significant strain to your body. Unfortunately, this is where it becomes a bit of a trade-off. Heavier packs often have more comfort features than lightweight ones. If you plan on taking short hikes, the extra pounds might not be so much of an issue. On longer hikes, perhaps think about the extra things you pack and keep them to only essentials. Alternatively, grin and bear it, and think of it as an extra workout for the baby pounds you might have gained. Unframed carriers generally have small pockets, for a smartphone or keys. Most hiking carriers have an array of pockets for storage. These can vary from mesh pockets to zippered ones, detachable backpacks, or hydration pack pockets. They supply plenty of room for any extra kit you need, like diapers, spare clothes, snacks, and water. Just bear in mind, you’ll have to carry the pack and your baby. Tempting as it might be to take some things “just in case,” stick to taking only what you need, unless you’ve got someone helping with the load. Trekking can make you hot and sweaty, even without carrying an additional passenger. This makes ventilation an important feature, both for you and your little one. As far as baby is concerned, openings at the side and top of the carrier do a pretty good job of making sure they get airflow to stay cool and comfortable. For you, most carriers come with a mesh covered back and allow airflow between the carrier and your body. This doesn’t mean your back won’t get sweaty, but you might not look like you’ve just walked through a rainforest at the end of the hike. This clever bit of kit helps your carrier stand on the floor when you take it off. Look for one that deploys easily and isn’t likely to trap little, or big, fingers. Make sure it actually gives stability — you don’t want it toppling over. Whether you’re taking to the mountains, strolling through a forest or following a gentle trail around the lake, there is a carrier to suit you. There are lots of carriers designed by experts to ensure you and baby can comfortably enjoy nature at its finest. Here are our top ten choices to help you do just that. Comfort for both you and your child when out on a hike is usually foremost in your mind. Carrying a little one along a trail can be a challenge, but is easily overcome when you choose the right mode of transport for them. Cushioning and a good fit for you and your mini human will help you go the distance. 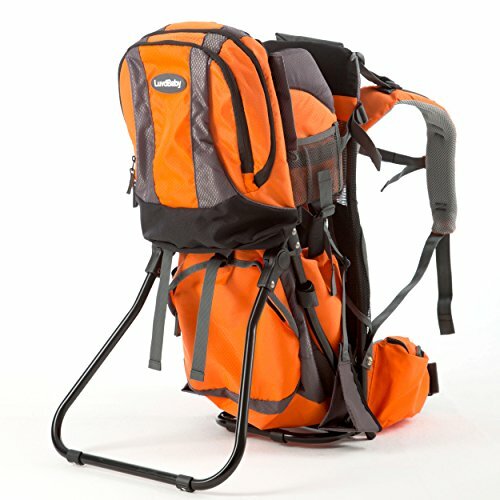 This carrier from Deuter has been JPMA certified for safety. It’s also been tested independently to meet federal and state guidelines, so there should be no worries over safety. The company has been producing backpacks and outdoor gear for over a hundred years — they must be doing something right! Although on the heavier and larger side, it can carry little ones from when they can hold their head up, until they weigh 48.5 pounds. Its VariFit system is easily adjustable for any wearer and fits waist sizes from 24 inches (I wish!) up to 54 inches. I love that we can transfer it, complete with kiddie, between my partner and me. Pivoting hip wings move with you, even when the trail is uneven or steep. The shoulder straps are S-shaped, to help relieve strain on your neck. And just what mama wants to see: plenty of storage pockets, including two suitable for hydration packs, to carry all the additional bits you might need. It has a collapsible sun guard, and a rain cover can be purchased separately. These are essential for protecting little one from the ever-changing elements. Your baby’s comfort is catered for with an ergonomic adjustable seat. It also has height adjustable foot stirrups, side entry, and well-ventilated fabric. In short, all the extras you might be looking for. A nice extra touch is a comfort pillow for if they happen to fall asleep, and even a teddy bear. The five-point safety harness is super secure and adapts as your child grows. For those who aren’t feeling so confident in the beginning, the sturdy aluminum frame has grab handles for ease of lifting. The airflow system and enhanced mesh fabric help keep you cool, which is essential when hiking. Plus, it has a useful kickstand for stability when removed. Padded adjustable cockpit for your child. Easy to get your child in and out. Removable pillow/drool pad, which is easy to wash. Fully adjustable for any body shape or size. Might take a few adjustments to get a comfortable fit. 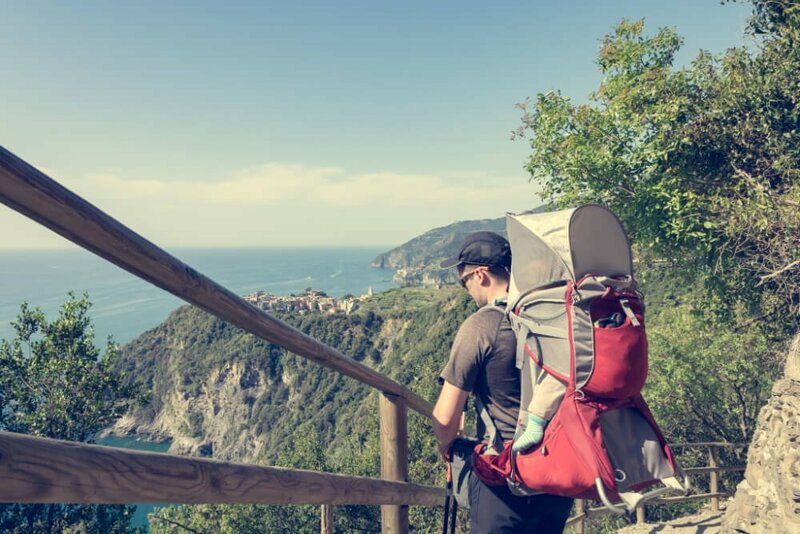 Your newborn won’t be ready for a purpose-built hiking carrier. They don’t provide the level of support needed for a tiny baby. You will need a more traditional one that allows your little bundle to be carried in front of you, and which supports their head. Ergobaby has been producing baby carriers since 2002. Designed by a mom, these carriers are ergonomic and recognized as a hip-healthy product for baby, so you know their legs are held in the correct position. Suitable for children from 7 to 45 pounds, I like that this carrier will adapt and grow with baby, from newborn through to toddler. The seat adjusts so that baby can be carried on your front, facing inward, while they’re still small. As they grow, you can carry them on your hip or back. There is an extendable back panel which can be used to support a little one’s head, or be extended to provide back support for a toddler. This is an important feature in a soft style carrier. Not only is this carrier cozy and snug for kids, but it’s also comfortable for parents. It’s great when you stroll along and forget the extra weight you’re carrying. 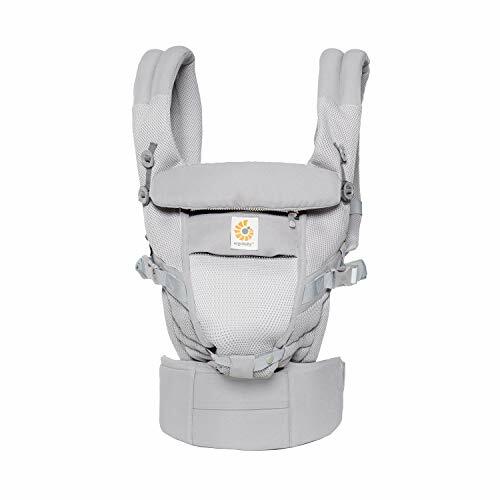 The Ergobaby Adapt has a lumbar support padded belt at the waist, which adjusts easily. It gives the support needed for good posture, to help prevent lower back pain. It can also be worn high, which is an advantage following a C-section. The shoulder straps are padded for extra comfort and can be worn criss-cross, making it a good choice for more petite parents. You can also wear the straps backpack-style, if you have a longer torso. The carrier can be adjusted to suit multiple body shapes and sizes, which is always a bonus. The waist strap will fit sizes between 26 inches up to 55 inches, and the shoulder straps adjust from 28¾ inches up to 48¾ inches. This is particularly useful when mom gets tired and wants to pass the carrying duties to dad. Being out on the trail, especially in summer, can mean getting hot and sweaty. 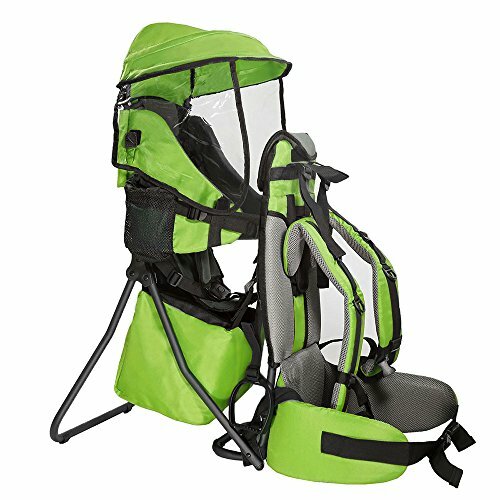 The cool air mesh fabric in this carrier allows plenty of airflow and breathability for both you and baby. There is a baby hood, which can be used for privacy when breastfeeding or as a UPF 50 sun shade. This is ideal for helping to protect baby’s delicate skin from the sun. The carrier is machine washable so that you can clean up easily after the inevitable little diaper accidents. Economical since you only buy one carrier for newborn all the way to toddler. Adjustable for many body shapes and sizes. Three different baby positions to choose from. Cannot be adapted to forward-facing. Once your child can sit upright, a purpose-built hiking carrier is a great choice. If you want to introduce your toddler to the wonders of nature on your hikes, get a carrier that lets them sit up high, seeing what you can see. The Thule group manufactures products with an active lifestyle in mind. The Sapling Elite child carrier is no exception to this ethos. 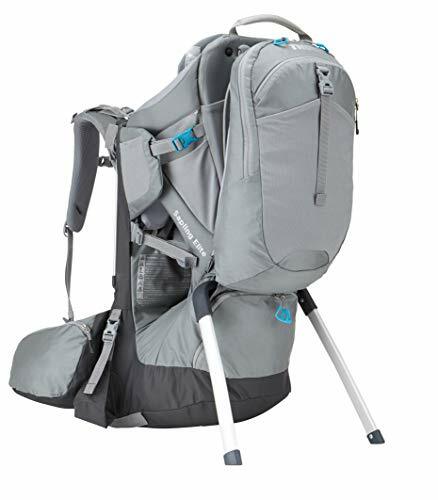 The 7.9-pound carrier is large but has tons of features active parents will appreciate. For your little one, it has an adjustable seat with built-in protection for their delicate thighs. There are detachable stirrups, so the weight can be taken off tired little legs, plus a shade to protect from the harmful effects of the sun. For mom or dad, the backpack has an adjustable back panel and waist or hip belt. You get to choose the most comfortable carrying position for you, which not all carriers offer. The stabilizer straps are easy to adjust on the go, and allow you to alter your child’s center of gravity on your back. Taking an infant out and about always involves lots of additional kit. This carrier has plenty of storage in the form of large back compartments, spacious zippered hip pockets and a pocket for a hydration pack. There’s even a removable backpack which comes in handy. Plenty of space for diapers, spare clothes, snacks, and toys. In the case of my little one, a spare pacifier in the zipper hip belt was a must. These inevitably get launched into the bushes or lost along the way. The breathable material on the back panel allows for plenty of airflow, which keeps you cool and reduces the chance of a sweat-drenched T-shirt. One of the great features of this carrier is the option for side entry. This means once your child is able, they can climb in and out by themselves. No more getting feet stuck in the leg holes as you lift them in and out! A fun extra is a rear view mirror supplied in its own pocket, so you can see if your little monster is behaving behind you. Thule believes this carrier is built to last and backs it up with a limited lifetime warranty. 48-pound capacity is great for larger babies and toddlers. Plenty of storage space so you have everything you need on hand. Adjustable child seat and stirrups make for a comfy fit. There are lots of compartments, belts and buckles to learn how to use properly. Once your child gets a bit older they might be able to walk with you while you’re hiking. However, their little legs can still get tired quickly, so a backup carrier is a good option for longer hikes. Just make sure it has the capacity for the weight of an older child. Kelty’s mission is to get kids back outdoors. Part of the redesigned range for 2018, the PerfectFIT carrier is good for taking older kids out on the trail. Weighing just 6 pounds 6 ounces, it gives more room for your child and extra gear. The carrier measures 28 by 15.5 by 22 inches and has an impressive storage capacity of 1587 cubic inches. Sturdiness is provided by a lightweight aluminum frame, padded roll bar, and auto-deploy kickstand. The wide seat base and adjustable stirrups keep your big kiddie comfortable. The maximum weight, including gear, the carrier, and child is 48.5 pounds. This means it’s suitable for carrying kids weighing between 16 and 40 pounds. 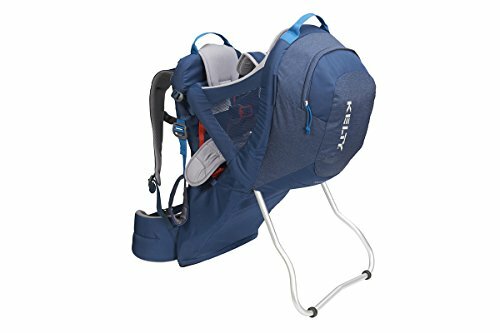 Designed for comfort for parents too, the Kelty suspension system adjusts to fit perfectly. It has mesh pockets on the hip belt for small essentials, and a large pocket to store things like toys, snacks, and sunscreen. On the downside, don’t forget the sunscreen, since there’s no sunshade included. However, one can be purchased separately to fit the carrier. One of the sturdier options on the market if you’re expecting to get a lot of wear out of your carrier. Auto-deploy kickstand, which means one less thing to think about. Wide seat base and adjustable stirrups. Two large grab handles at the top, making it easy to move when not in use. Carrying a larger child might decrease storage capacity. 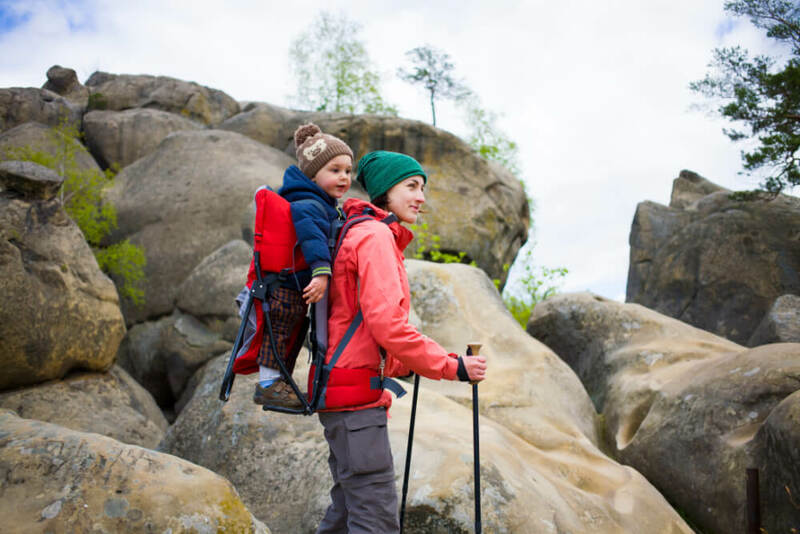 Carrying your child with you on a long hike can play havoc with your back and shoulders, especially if you tend to suffer from back pain You can’t make your child weigh any less, but the more you can reduce the weight of the carrier, the less it’s likely to take its toll on your body. At just 4.4 pounds, this carrier is lightweight but still has tons of features. It can carry a child up to 40 pounds, and even folds flat when not in use. It’s perfect for ditching the stroller when traveling and is accepted by most airlines as carry-on luggage. The aluminum frame gives the carrier stability and strength when loading up your child, and allows freestanding. A feature I really like is that the fabric is washable and waterproof, making it an ideal choice for wet weather hiking. The molded mesh back is air-tech ventilated, keeping you cool while providing comfort for your back. Ergonomically-fitted shoulder pads and hip belts are supportive but soft. This means you won’t be wasting time worrying about the carrier, and can focus on enjoying your outdoors time with your baby. Conveniently, it has storage for a drink bottle and a pocket for keys on the side. There’s also room beneath the seat for diapers, food, and a change of clothes for your kiddie. You won’t be scrambling to find what you need with a wiggly baby on your back. A detachable mini-backpack is perfect for little ones who want to help share the load and carry their own toys or snacks. When they get fed up and hand it back, just zip it back on again. Weighs just 4.4 pounds, so no excessive strain on your back. Ample storage for all your hiking essentials. It’s compact enough not to hog space at home when you need to store it. No cushioned support for a little one’s head. Riding high on mom or dad's shoulders is always a hit with kids. However, it can get tiring for the person carrying them. An ergonomically designed carrier giving your little ones the same view you have, without breaking your back, is a winner. The Piggyback rider is the brainchild of the Lifshitz brothers. Tired of carrying their own ever-growing children around, they invented this carrier. It’s suitable for children between two and four years old, or weighing up to 50 pounds. If your back can withstand it, more weight can be carried. My husband drew the line when I asked to hop on. The carrier is portable and lightweight, at less than 3 pounds. It’s worn as a harness backpack-style and has a metal bar which your child stands on. There is a safety harness included, attaching your child to you. The weight of your child is distributed evenly along the bar, allowing you to stand upright, and there are integrated handles which your little one can hold onto. Should they slip, the harness prevents them from falling and the grab handles stop them from pulling your hair (hopefully!). This carrier is compact enough to take anywhere with you, folding up to the size of a rolled towel. When your child wants to run along the trail beside you, simply lower them down, ditch the safety harness and let them hop off. You can purchase additional accessories for this carrier, including a mudflap, water bottle holder, selfie stick carrier and hip belt. Compact and lightweight to bring along to any outing. Suitable for carrying older children. Kids love being carried up high. Perfect for kids who want to hop off to explore, but hop on again when they’re tired. Harness straps would benefit from more padding. Hiking can get expensive, and even more so when you need the extra kit to bring baby along. While you want to take your little one with you, having a carrier with too many fancy extras can be costly. A budget carrier with all the main features will save you some money, however. The backpack hiking carrier from Clevr Cross is lightweight as well as light on your pocket. Weighing just 5 pounds, it has a sturdy aluminum frame with a kickstand and folds flat when not in use, which is great for storage. Measuring 30 by 10 by 16 inches, it’s suitable for children aged from 6 months old. While it won’t support the weight of some of its more expensive rivals, it will carry your little one until they reach 33 pounds, up to about 4 years old, which might be all you need. The child seat is three-way adjustable and the foot stirrups can be moved to a position which is most comfortable for your child. This is especially handy when you don’t want to be kicked in the back for the whole hike. There’s a washable drool pad, essential for a little one that dribbles when they nod off. A retractable rain and sun canopy are included, so there’s no need to buy any expensive extras. The carrier straps are fully padded and the hip belt and lumbar padding make it comfortable to wear. There are multiple storage options, including two water bottle pockets and a large back pocket. In other words, this backpack has everything you need without the hefty price tag. Lightweight and durable at an affordable cost. Plenty of storage, so you don’t need to bring too many other bags. Adjustable for both child and parent. Baby sits quite high up so they don’t miss any of the action. Sunshade could give more coverage. Many parents have found the waist buckle to be poor quality. If you plan on taking a short hike, you might not want to pack up everything and the kitchen sink just for a half hour. Maybe you just want to take a stroll around the lake or visit the local park. A lightweight carrier might be the best option for you. The Boba 4G is a lightweight carrier, super for shorter adventures with your little one. It’s compact enough to just throw in the car and drive to the beach for a nice walk. You could even pop it in a bag to use when little one gets tired of walking. This would have been so useful all those times when I had a tired, squirming toddler in my arms. It will carry a child from 7 pounds to 45 pounds, using a front or back carry. There’s even an integrated infant insert for small babies. The carrier weighs just two pounds, and the shoulder straps can be adjusted from 20 inches through to 40 inches. The hip belt fits waists from 25 inches through to 58 inches. It will fit adults from 5 feet through to 6.3 feet tall, making it suitable for moms, dads, aunts, and uncles to use. Made from 100 percent cotton, the carrier will keep you both cool. There are removable ergonomic adjustable foot straps for a toddler or older child. Storage for small items such as a mobile phone, money or credit cards is built in. There are also strap holders to carry a purse or an extra bag when you visit the grocery store on your way home. Additionally, the carrier has a removable sun shade/privacy hood. The Boba 4G comes in plain colors, but there are also a number of fun patterns for those who want something different. Wide, comfortable padded straps for a comfy walk. Storage for smaller items so you don’t need to bring a purse along. You might need help to put an older child in the carrier on your back. Hiking with your little ones can involve carrying lots of extra baggage to haul all those diapers, clothes, food, water, and toys... and that’s just for them. What about all the additional items you need, like smartphones, sunscreen or jackets? Having ample storage in a baby carrier means fewer bags to carry. 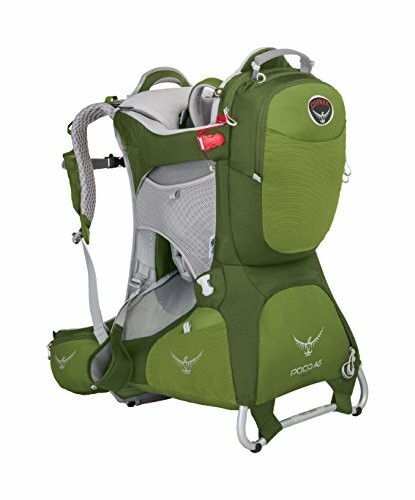 This hiking backpack baby carrier has loads of large and small pockets, some mesh and some zippered. They’re located under the cockpit, on the back, and on the waist belt. There’s even an insulated pocket for a baby bottle or a drink. I love that a detachable backpack and foldable diaper changing mat are also part of the deal. These are ideal for when you want to lay your little one down somewhere clean when you’re out in the woods. Made from durable nylon, the carrier is waterproof to withstand the elements. We all know how suddenly the heavens can open when we’re out and about. 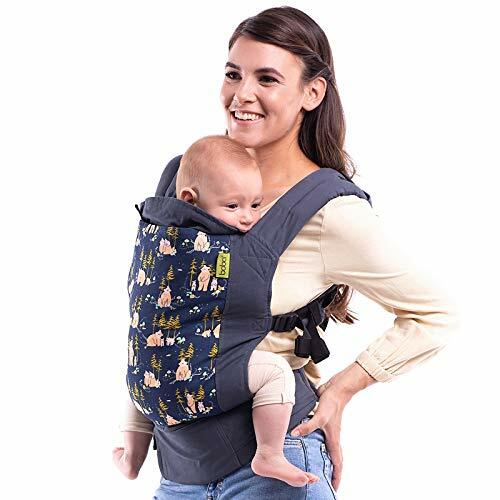 The carrier can be adjusted to fit most heights, and has padded shoulder straps and waistband, so it’s comfortable for baby-carrying moms and dads. The aluminum frame has a kick-out stand for stability when you place it down. There’s a comfortable cockpit for your baby, as well as safety straps and adjustable stirrups. A stowable hood protects your child from the sun’s harsh rays. Ample storage in both zippered and mesh pockets. Durable, waterproof material that’s also easy to clean. Instructions for use are lacking in detail, so there’s trial and error when learning to use this. Being able to adjust a child carrier easily makes hiking with your growing child so much more pleasurable. When the weight of the child is well distributed, you’re not putting strain on any one point, and can get on with enjoying your walk. Osprey is dedicated to creating comfortable backpacks for outdoor pursuits. The company has taken its anti-gravity suspension system and custom fit philosophy and applied them to this child carrier. The hip belt, shoulder straps, and torso strap can be adjusted quickly and easily. The result is a very comfortable carrier for both you and your child. The design lets your hips take the strain, rather than your back and shoulders. It’s on the heavier side, at 8.3 pounds, but will carry a child and gear weighing up to 48.5 pounds in total. If you want to lighten the load, there’s a detachable backpack for storing extra kit for you and baby. Speaking of storage, there is another large compartment under the baby seat, a pocket for a hydration pack and zippered pockets on the hip belt. There are even loops where you can attach baby toys to keep your little one entertained. The comfort of your child is taken into account by a fully framed and padded seating area, which has a butterfly harness covered in a lovely soft fleece. Several extras are included, such as adjustable stirrups to keep those little feet and legs in place, a removable, washable drool pad, and an integrated sunshade. A locking foot bar provides stability for the extra wide base when you take the carrier off and put it down. Osprey offers a guarantee to repair or replace your carrier if there are any defects. This gives peace of mind to parents hesitant about committing to such an expensive piece of gear. Anti-gravity suspension system with plenty of airflow for comfort. Easy to adjust between users. Safety mirror included; easily check on the little monkey on your back!. Some find the hip belt hard and uncomfortable. Whether you’re new to hiking or a seasoned pro, remember that things are different when you have a little one in tow. A hiking carrier will make a lot more places accessible to you than a stroller, but there are, of course, some limits. Stick to easy trails which are kiddie friendly, those these. It might be a bit hit-and-miss to start off with. I found speaking to other parents useful, as they offered some recommendations. Alternatively, your state or county parks department can point you in the right direction. What you don’t want to do is head to places where there could be loose rocks or steep inclines. Your precious cargo will add weight and, as we know, kids don’t always keep still. These factors can affect your balance. While it may seem like you can just pop babes in the cockpit, strap the pack on and go, this is not usually the case. You need to make sure the carrier is adjusted properly for both you and baby. A good trick when first fitting a new carrier is to use some books (or even dumbbells) equal to your baby’s weight as you make adjustments. Just remember, you’ll need to check the fit each time you put the carrier on. Adjust the suspension system to fit the trunk of your body. The hip belt should sit on your hip bones (not your waist) and the upper straps should rest on your shoulders. Use adjustments to tighten the hip belt so that about 80 percent of the weight is carried by your hips. Pull the shoulder straps tight to stabilize the carrier and take the rest of the weight on your shoulders. The load lifter straps will run from the shoulders to the top of the back panel. They should be at about a 45-degree angle. Make sure the chest strap is not so tight as to interfere with your breathing. Making sure the carrier is adjusted as much as you can for your child will save time when you hit the trail. Before placing them in the carrier, make sure the kickstand is extended fully so the pack is stable. Loosen off the safety harness straps. Adjust the height of the child seat. Put your little one in the carrier and make sure their feet and legs are through the correct leg openings. Buckle all the straps and tighten them. Ensure they’re fitting comfortably and aren’t too tight or twisted. Double check the seat height once they’re in. Ideally, your child’s chin should be about level with the top of the dribble pad. If your child is old enough, and the carrier is equipped with them, pop their feet in the stirrups. The first few times you put on the carrier with your child inside, you might feel a bit unsure. Get someone to help you until you’re confident doing it by yourself. It’s just like lifting a heavy backpack. Use the handles at the top, slip the shoulder straps on and tighten them. Adjust the carrier to fit. To remove the carrier, loosen the shoulder straps and unclip the hip belt. Grab the handle located behind you and swing the carrier gently around, so it’s in front of you. Take hold of the second handle and gently set it on the ground, engaging the kickstand. Never leave your precious little bundle unattended when they’re in the carrier. If your baby falls asleep, as they often do, regularly check that their neck is supported. Don’t place your carrier on an elevated surface with a little one inside. Make sure your child is protected from sun, wind, or rain, and that they don’t get too cold or too hot. It’s not advisable to allow your child to eat when riding in the carrier; it could be a choking hazard. Although you want your child to enjoy the view, they may not appreciate the great outdoors for the whole hike. Clip a toy to the carrier to keep them amused. Make sure it’s set up safely and is not likely to cause them to choke. It’s a good idea not to take their favorite toys or comfort objects on the trail. God forbid they should get lost. My child’s favorite toy spent a night on the driveway once, and I spent the whole night trying to console the little mite! Now we’ve looked at what I think are some of the best hiking carriers available on the market, I have to say my favorite is the Deuter Kid Comfort 3. 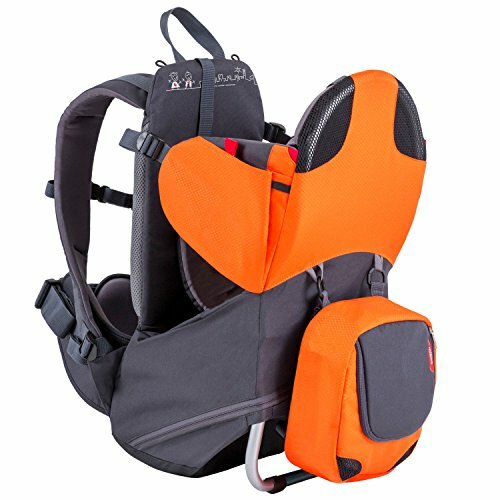 It has all the comfort, airflow and adjustability you need in a hiking carrier, both for you and your child. Easily transferable from one parent to another, it has a total weight capacity which will cover you until your child is old enough to walk alongside you. Complete with ample storage and a sunshade, you even get a comfort pillow (sorry, only for baby, not you) and a cute teddy bear. Here’s wishing you happy trails for you and your little tykes. I’d love you to leave a comment — and don’t forget to share this page with fellow outdoor moms and dads.